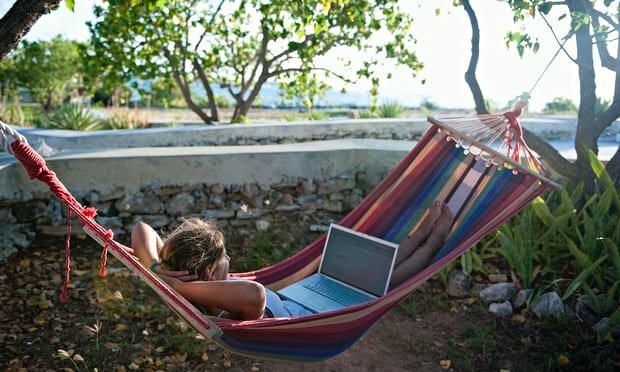 In the age of smartphones, social media and cheap international calls, the perfect holiday for a growing number of people involves taking a complete break from the digital world. But a new travel phenomenon turns this concept on its head. It’s called the “co-working holiday”. The concept is simple: solo travellers visit a beautiful location, and work in a shared space while they’re there. Though it might go against the very definition of what a holiday is, these breaks are proving attractive to those who don’t like the idea of switching off while abroad. Location-independent bloggers and early-career entrepreneurs (especially in the tech industry) are prime candidates for co-working holidays, according one such operator, Livit Spaces in Bali. “We offer entrepreneurs a space where they can focus on their work, and immerse themselves in a super-productive environment with a network of like-minded, passionate people,” says community manager Nick Martin. His Indonesia-based company offers all-inclusive packages with accommodation, meals, daily cleaning, office space, networking events and excursions from around £48 a night. A network called Coworking Visa lists 450 independent co-working spaces across the world, including 15 in the UK. An increasing number of their members are starting to offer residential options in addition to on-the-move office space for those working and travelling. Their clients include writers, bloggers, artists and designers as well as businesspeople and entrepreneurs. Some co-working holidays, such as US-based Hacker Paradise, which launched in summer 2014, run for a specific period annually, offering structured packages. Last year this company – which despite its name is open to artists and creatives as well as tech developers – was based at a hotel in Costa Rica. This year it is spending a month each in Vietnam, Bali, Thailand and the Philippines. Travellers can join for a week or up to three months. A month’s stay costs from £400 in a shared room, or £1,000 for a private suite. Breakfast, dinner, 3G SIM cards and office space with Wi-Fi are included. Other operators such as Sun Desk, based in Taghazout, a surf haven in southern Morocco, and 47 Ronin, in a residential area of Kyoto, Japan, take bookings throughout the year, charging around £16 a night for accommodation, workspace and breakfast. Surf Office offers co-working stays in Santa Cruz, California, and the Canary Islands, and is planning two new destinations this year. A private room by the beach in Santa Cruz will set you back £62 a night, including on-site office space, a shared kitchen and weekly lifts into San Francisco, as well as yoga sessions and supplies of water and organic coffee. In the UK, 4.6 million people, or 15% of the workforce, are now self-employed – the highest number since records began. While co-working holidays won’t be for everyone, the need for alternatives to traditional holidays may well see growth that matches the rise of self-employment. But whether that’s a good thing for overburdened modern workers remains to be seen.